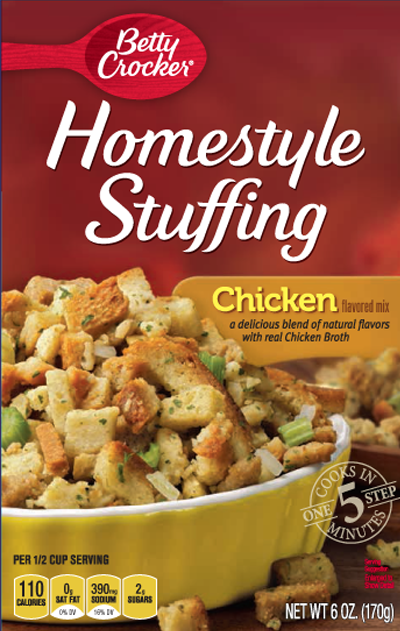 Ingredients: Enriched Wheat Flour (Wheat Flour, Niacin, Iron, Thiamine Mononitrate, Riboflavin, Folic Acid), High Fructose Corn Syrup, Onions*, Salt, Partially Hydrogenated Soybean and Cottonseed Oil, Hydrolyzed Corn & Soy Protein, Yeast, Cooked Chicken and Chicken Broth, Celery*, Monosodium Glutamate, Soy Lecithin, Parsley*, Chicken Fat, Whey (from milk), Dextrose, Spices, Sugar, Turmeric (color), Corn Starch, Caramel (color), Natural Flavor, Calcium Propionate (preservative). In a medium saucepan, heat 1½-cups water and ¼ cup (½ stick) butter or margarine to a boil (melt butter/margarine completely). Stir in contents of stuffing mix pouch. Remove from heat, cover and let stand 5 minutes. In 1-1/2-quart microwave safe bowl, mix contents of stuffing mix pouch with 1½-cups hot water and ¼ cup (½ stick) butter or margarine, cut into pieces. Cover, and microwave on HIGH 5 to 6 minutes.